Over the past week, Senior Colson Fellow Glenn Sunshine has taken to Facebook to do something that much of the mainstream media--to its discredit--has neglected to do: alerting people to what is happening to Christians in places like Nigeria. Last summer on BreakPoint, I talked about the violence targeting Christians in what's known as the "middle belt" of Nigeria. The population of Nigeria is almost evenly divided between Muslims and Christians. That religious split largely follows geographic lines: The northern part of the country is predominantly Muslim, the eastern and southern parts of the country heavily Christian. The "Middle Belt" is, as you probably guessed, ethnically and religiously diverse. In this part of the country, Christians have been on the receiving end of a campaign that Open Doors calls "religious cleansing," that is, an attempt "to eradicate Christianity" from the region. One of the most notorious Islamist groups in the world, Boko Haram, is responsible for killing thousands of Christians and displacing countless more in northern Nigeria. But Boko Haram isn't the only group targeting Christians there. In late June, Christian leaders claimed that "over 6,000 persons--mostly children, women and the aged--have been maimed and killed in night raids by armed Fulani herdsmen." The Fulani are an ethnic group that are overwhelmingly Muslim, and for the record, their raids are not always at night. In their statement, Nigerian Christian leaders also complained about the "continuous abduction of under-aged Christian girls by Muslim youths..." These girls "are forcefully converted to Islam and taken in for marriage without the consent of their parents." 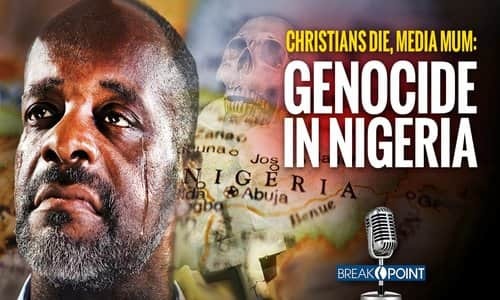 While Open Doors calls what is happening in the Middle Belt "religious cleansing," Nigerian Christian leaders have called it genocide, and not without good reason. Under the International Convention for the Prevention and Punishment of Genocide, genocide consists of action intended to destroy in whole or in part, "a national, ethnic, racial or religious group." The actions can include "killing members of the group," "causing serious bodily or mental harm to members of the group," and "forcibly transferring children of the group to another group," among other things. Where is the Nigerian government in all of this? At best, nowhere to be found. Officials are downplaying, if not outright denying, any religious dimension of what's happening. Instead, they're calling this a conflict over resources, in this case, over land. Yet, the mainstream media here in the States remains mum. Which is why Glenn is using his Facebook to bring this to people's attention. As tempting as it is to speculate why we aren't hearing about it, that won't do our Nigerian brethren a bit of good. It won't put pressure on our government to speak up, or on the Nigerian government to do its basic duty and protect all of its citizens. What will help is emulating what people like Glenn Sunshine and Mindy Belz of WORLD Magazine are doing-using the channels and forums available to them to spread the word. This kind of intentional and thoughtful engagement--along with, of course, our most important efforts of consistent and concerted prayer--is our brethren's best chance at relief. It's a task we all must embrace.